The housing and credit bubble that collapsed in 2008 was obviously a huge financial crisis that brought down major banks. But unless you understand the complicated ins and outs of hedge funds and collateralized debt obligation (CDO), even with the amusing asides by celebrities to explain them, it's still gobbly gook to most people. 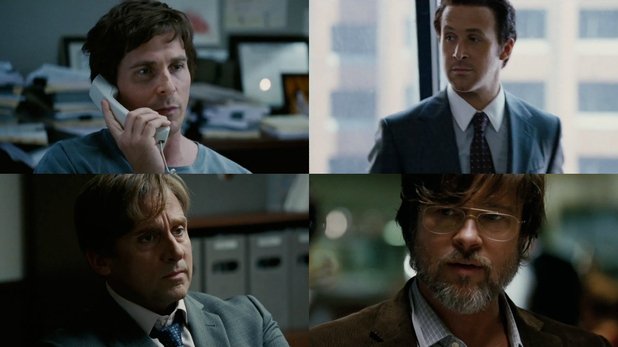 Based on the book of the same name by Michael Lewis, it was directed by Adam McKay who also wrote the script with Charles Randolph. The story covers different key players in the creation of the Credit Default Swap market. Despite not being able to understand the intricacies of the math, it's still and exciting and fast moving tale that uncovers the greed and corruption in Wall Street that in a documentary form would have bored one in tears. This engaging big screen narrative makes it easier to digest so that people are made aware and hopefully forewarned should this ever happen again. Christian Bale plays Dr. Michael Burry, an ex-neurologist who is blind in one eye, has Asperger's syndrome and created Scion Capital. He predicts the market is going to crash so he invests the company funds into the credit default swap. The banks are laughing while they agree to his terms and Burry's boss is livid. Others also get wind of the encroaching bubble burst including outspoken hedge fund manager Mark Baum (Steve Carell) who is informed by Deutsche Band trader Jared Vennett (Ryan Gosling) of the activity that is looming. They run the numbers and realize that they should also invest in the swaps. The two young founders of Cornwall Capital started their hedge fund in their Colorado garage and built it into the millions. They want a seat at the “big boy's table”, but are turned down, so they seek the help of a former neighbor who quit the financial world for a healthy life, Ben Rickert (Brad Pitt). They also realize that the predictions of a crash is coming and look to bet against the market. Baum's team investigate in Florida the so called housing boom, and discover that mortgages are basically given out to anyone and everyone. Unscrupulous mortgage managers are making money hand over fist, while homeowners are defaulting on the loans. Baum is frightened and upset that the American dream is being destroyed by major financial institutions that bundle these mortgage loans and sell them. When things begin to fall apart, even the financial rating houses play as the banks want them in order to keep they business to keep the facade going. Burry is slowly loosing his investors as his swap scheme is still not paying as it should. All the short investors and hanging by their nails, until it all tumbles. They eventually get their profits, the banks close down and nobody but one person gets arrested for all the wanton fraud. Then banks gets bailed out by the American public and business still goes on as before. This film will definitely challenge your brain, but it's well done, excellent performances.